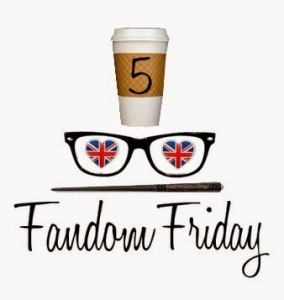 It’s Friday again and that means it’s time for the Nerdy Girlie’s 5 Fandom topic for this week which is Characters I’d love to dress up as for Halloween. I’m not a huge fan of dressing up in costume but I have seen some clever dresses and stuff that really appeal so here is my Top 5 Costumes for people who don’t want to really dress up! I’m cheating a little bit as the topic is about characters but the Tardis has a personality so I count her as a character too! 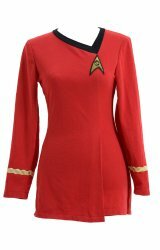 I love this Red Star Trek Uniform Dress but I’d have to wear it over leggings or jeans as it is extremely short – probably closer to a long t shirt than a dress for most ladies I know! I certainly don’t have the legs that Lieutenant Uhura had. The best thing is, you don’t have to have the red one, there’s blue and yellow ones available too. Remember – the red shirts are always the first to die on away missions! This DC Comics Wonder Woman T Shirt includes the headband in the price and it has a cape! I’d probably try to detach the cape so I could wear the T-shirt at other times but it would make an quick and easy ‘costume’. With all the travelling I do, I wish I could fly like Wonder Woman and having just stayed awake for 36 hours on 3 hours sleep, I sometimes wonder if we all have a little Wonder Woman in us! Now this is a pretty cool, cheap and easy outfit for Halloween trick or treating. The Skeleton T Shirt & Leggings is probably as far as I would go to create a costume – buy a 2 piece set and be done! I love the t-shirt in particular and would probably wear that throughout the year. Why wait for Halloween to wear such a cool t-shirt huh? Tigger has always been a favorite of mine even if I’m more of a sloth than a bouncy Tigger! Compared to the UK, the winters in St Louis are super cold so I might need these extra comfy, fun and warm Tigger Pajamas. Judging by the reviews, these pajamas are thick enough to be worn outside – at least for 1 night a year! Dr Who Tardis Dress – ok, I’d probably never wear this Tardis dress due to my age and a certain consciousness of my size & shape but I’d love to be 18 again so I could wear it! Maybe if I paired it with leggings or jeans I could wear it as a long top? Hmm, decisions, decisions! Can you tell I’m not really into Halloween? I chose the costumes for what I would like to wear but really only the Skeleton is Halloween style and even that’s pushing it! I’ve seen many fairies, pirates and even Hello Kitty outfits running around trick or treating though so I don’t think there are any hard and fast rules anymore. The idea is to join in the spirit of dressing up so I’m not going to bash myself up because I like nice things not gory, creepy things! ← Top 5 Halloween T Shirts for Grumps! That Tigger costume was a favorite at old skool warehouse raves. Every single underground party I’ve ever been to there was at least once person dressed as Tigger, if not more than 1. So that costume definately sees all kinds of year round use.